In recognition of her pioneering and outstanding scientific achievements in virology and Immunology, including new knowledge that has been applied in medical practice,and for international standing as scientists,sharing here expertise with the World Health Organization and the health institutions of other countries. 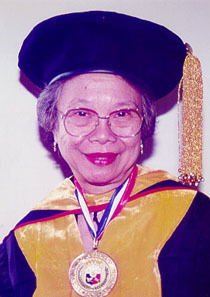 as one of the earliest pioneers in Philippine virology and immunology,she liberally opens her storehouse of knowledge to all. Her fruitful labors have brougth improvements in policy, management of severe cases of viral infections as well as their prevention and control.